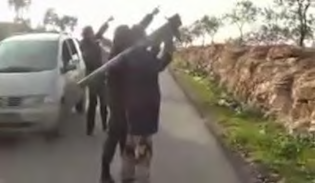 Islamic State terrorists in Syria, assisted by western experts, are trying to develop improvised anti-aircraft missiles following stepped up airstrikes against its forces, according to U.S. officials and reports from the region. The effort was disclosed by an anti-ISIS social media account that revealed the anti-aircraft arms development Dec. 15 on Twitter. According to the Twitter user @Raqqa_SL, the new missiles are being developed in a desert area north of Raqqa, the ISIS headquarters. The terrorists have tried linking five bomb detonators and explosives to captured anti-aircraft missiles to enhance their explosive power against aircraft. The added explosives are linked to walkie-talkies that are used to detonate the additional explosives in an attempt to create a larger fragmentation blast that ISIS hopes will impact bombing aircraft. U.S. and coalition aircraft have conducted numerous airstrikes against Raqqa. France stepped up its bombing of the city after the Paris terror attacks and Russia also is conducting large-scale and often indiscriminate bomb and missile strikes on the ISIS capital as well. "In this new Rocket they are trying to make AntiAirplanes Missiles in a way from them to shot the Warplanes down to stop the bombing #Raqqa [sic throughout]," the user stated. Asked about the improvised anti-aircraft missile effort, Col. Steven Warren, a spokesman for the military command in Iraq, said officials are aware of the program. "We know they are trying but have no concerns," Warren said. Warren added that the increased effort to stop airstrikes is an indication that ISIS is trying to counteract increased bombing raids. "Their efforts to build a homemade air defense capability highlights the fact that they realize our airstrikes are systematically dismantling them," Warren said. "They are trying to adjust. It won't work." Additional details were reported on a news website associated with the @Raqqa_SL Twitter account on the same day. The report stated that ISIS technicians, including a Dane of Iraqi origin and a Chechen Russian, as well as other Islamist technical experts, were developing "land-air" missiles. 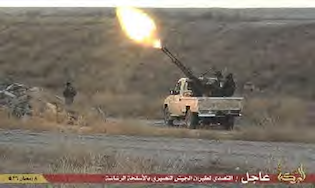 The report said a large increase in the number of ISIS anti-aircraft missiles were seen in a truck-launcher near a rail line in Raqqa. ISIS at one time was able to monitor air traffic over Raqqa and nearby Deir al Zour with a radar system that was linked to alarms used to warn residents of approaching aircraft, the report said. A reporter for news website reported that a new anti-aircraft missile was tested for the first time Dec. 13. "Our sources added, that this system was brought from Iraq and [has] been developed in the Iraqi city of Mosul, in camps allocated by the organization to develop its weapons, and then transferred to the city of Raqqa to link it with the radar system that [is] there and to impose a no-fly zone above it," the report said. The news report said "western military engineers" are working with ISIS to develop and produce the new types of weapons. A Marine Corps University report on ISIS weapons described the group as developing "an aspiring" air defense capability. "The Syrian air defense network, built largely in the 1970s, once had 25 air defense (AD) brigades with 150 [surface-to-air missile] batteries and 2,000 [anti-aircraft] guns of various calibers; many are now in ISIS hands," the report said. ISIS has been able to capture "significant" air defense nodes in Syria at Raqqa, Deiraz-Zawr, Taqba, Jarahand, and Hamadan. Shoulder-fired missile systems in ISIS control include the Russian-made SA-7 Grail, SA-14 Gremlin, SA-18 Grouse, and SA-24 Grinch missiles. 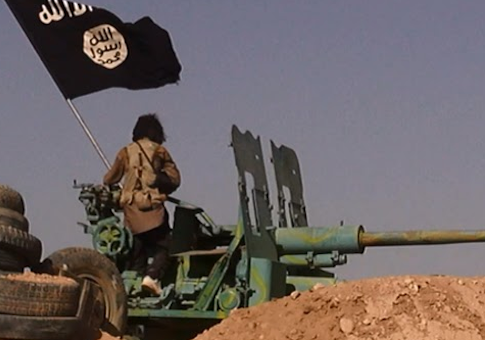 ISIS also operates mobile ZSU-23/2 mobile anti-aircraft guns. This entry was posted in National Security and tagged ISIS. Bookmark the permalink.